In my youth, a tattoo was only seen on military men or bikers. Otherwise it was something that was covered up. One lady described it as her permanent reminder of temporary insanity. The poor choices made with the aid of an altered state of mind. The label is or was a “tramp stamp”. Today, it amazes me the number of individuals with tattoos. Thirty eight percent of the Millennials (those born after 1980) (full report)have tattoos, compared with 32% of Generation X (1965-1980) and 15% of Baby Boomers(1946-1964). Ironically, Millennials are more conscious of social issues, organic food, conservation via recycling, and healthful exercise. For some a tattoo may be a way of feeling special, or an expression of individuality, devotion, or commemoration. Most of the health focus is on the self-imposed cleanliness of the operator, equipment and facility. The famous last words from someone you don’t know…“trust me”. Death by 1000 puncture wounds via the magical manifestation of hepatitis B, hepatitis C, HIV, Epstein Barr Virus, tetanus, tuberculosis or any other imaginable blood born infectious disease? While the initial and post tattoo pain is real, the other death by 1000 cuts is the slow un-noticed embracing of change with unwanted consequences that impact our heath. The tattoo is nothing short of a future health risk. The first rule of health is to avoid toxic material. 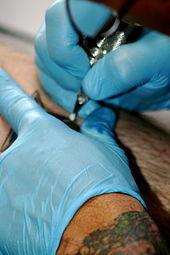 Few know the composition of tattoo ink that is no doubt toxic material foreign to the body. So we inject toxic material into the skin. The ink goes into the cell. The impregnation of the cell is the fourth stage of disease. The fifth stage is degeneration of the cell and the sixth is cancer. The body has mechanisms to remove toxins from the body, which means the material may travel thru lymph fluid or blood to end up anywhere. It is possible that the liver may not be able to process such chemicals, especially if viruses, nutrients, drugs or alcohol compromises it. This means the toxin must be deposited in fat or connective tissue for storage. This is the creation of a disease state that will never be connected to acts of youth. Do we really need a more toxic personal environment?